Above - Elevation of the Theatre Royal, Liverpool - Courtesy John West. 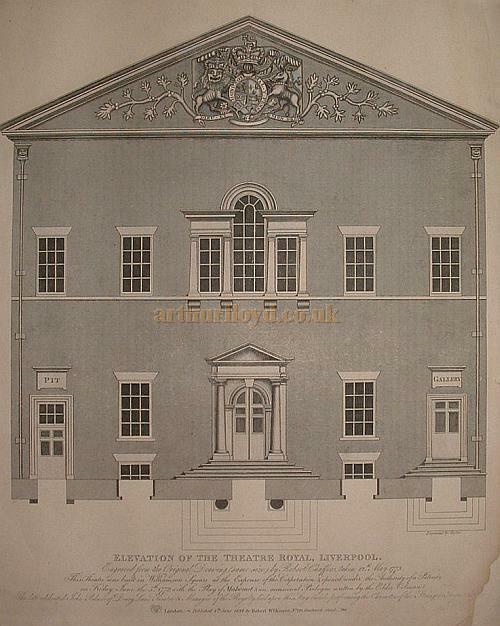 Caption Reads: "Elevation of the Theatre Royal, Liverpool, Engraved from the original drawing (same size) by Robert Chaffens, taken 12th May 1773. This theatre was built in Williamson Square at the expense of the Corporation and opened under the authority of a Patent on Friday June the 5th 1772 with the play of Babemet and an occasional Prologue written by the Elder Coleman. The late celebrated John Palmer of Drury Lane Theatre and Manager at the Royalty died upon this while performing the Character of the stranger August. Published 4 June 1822 by Robert Wilkinson." The Theatre, which should not be confused with the later Theatre Royal on Breck Road, opened under the management of Joseph Younger and George Mattocks and was designed by Sir William Chambers, and built by subscription, of which thirty different gentlemen contributed about £170 each, a considerable sum in the 1770s. Each of the subscribers were given 5% of the takings and a transferable ticket. Right - A very early Bill for the Theatre Royal, Williamson Square, Liverpool on Saturday the 12th of November 1774 - Courtesy Carol Shone. There are more early Bills for this Theatre below. The Theatre was rebuilt in 1802 by Foster with an almost circular frontage. This Theatre would eventually be taken over and converted into a Cold Storage Unit. The building was demolished and the site was cleared for the construction of a "Civic Centre" (Council offices) in the mid 1960s. However, it was still vacant eight years later. The site is now apparently the home of the official Liverpool Football Club store. This Theatre Royal in Williamson Square is not to be confused with the Theatre Royal in Breck Road which was built in 1891 as the Theatre Royal Palace Of Varieties by W. Redman. In the drawing at the top of this page the proportions are credited as being 9 7/8" wide and 10" high at the apex on the pediment. The doors are 5/8" wide and the steps are 1/8" high. It suggests a scale of 3/16":1'0". 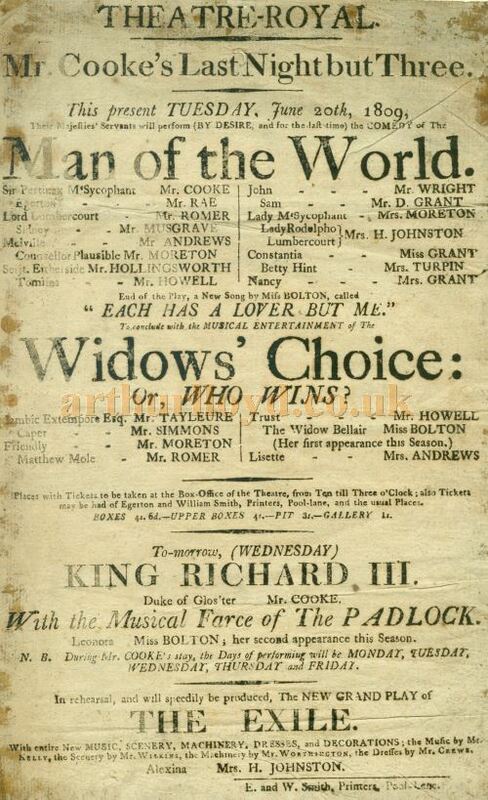 Much of the information on this page for the Theatre Royal, Williamson Square, and the drawing of the Theatre at the top were kindly sent in by John West. Arthur Lloyd is known to have performed at this Theatre in 1867. There are a few images of the 1802 rebuilt Theatre Royal, Williamson Square here. Above - Two Tickets for 'Mr. Palmer's Ball' at the Theatre Royal Williamson Square, Liverpool in the early 1800s - Courtesy Gerard Prior. 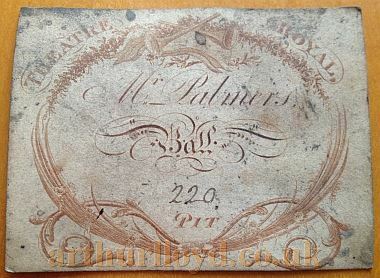 The tickets were found under the floor boards of a building in the Liverpool City Centre during refurbishment in 2014, and relate to a Dance Academy set up by James Palmer and his son John Barton Palmer in the early 1800s, at their home at 12, St. Ann's Street, Liverpool, and at Nelson Street, Great George Square, and King Street, Soho, Liverpool. 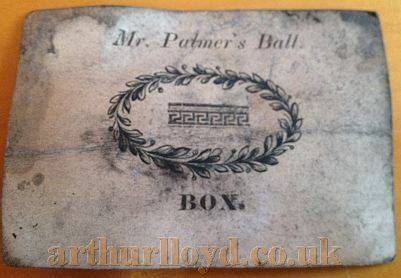 They would regularly hold a Ball for their students at the Theatre Royal, Williamson Square for several decades up to the 1850s, eventually run by John Barton Palmer and his son, James Palmer, (after the original James Palmer). The academy taught people how to dance Quadrilles, Minuets, and Spanish Country Dances amongst others. 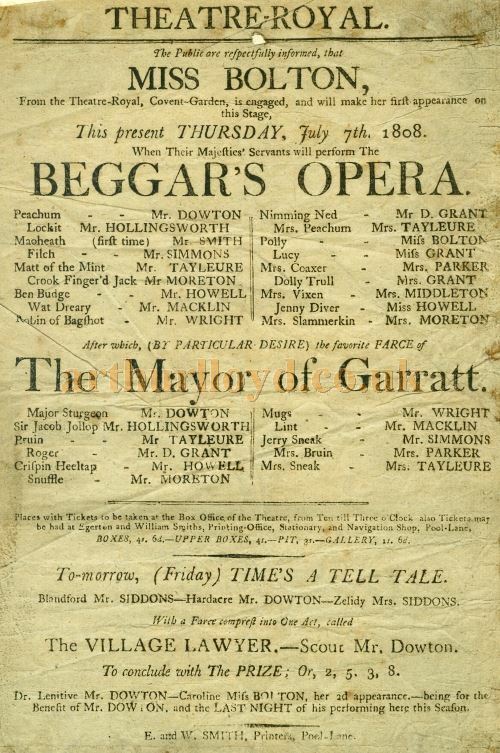 Research suggests that the simpler Ticket is probably for a Ball held at the Theatre Royal in around 1823 and the more elaborate one for around 1828. They also held a Ball in the assembly rooms in Renshaw Street on at least one occasion in 1855. Many thanks to B.F. for his research into the Palmers. Note: These Palmers have no relation to the actor John Palmer who died on stage at the Theatre Royal in 1822. 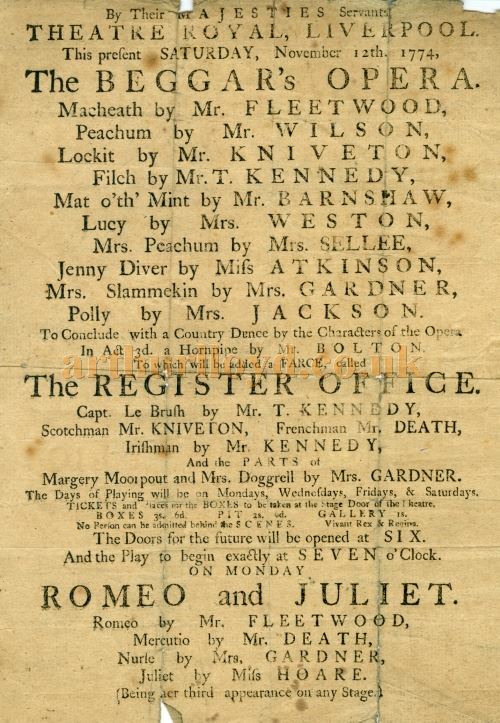 Above - An early Bill for the Theatre Royal, Williamson Square, Liverpool on Thursday the 7th of July 1808 - Courtesy Carol Shone. 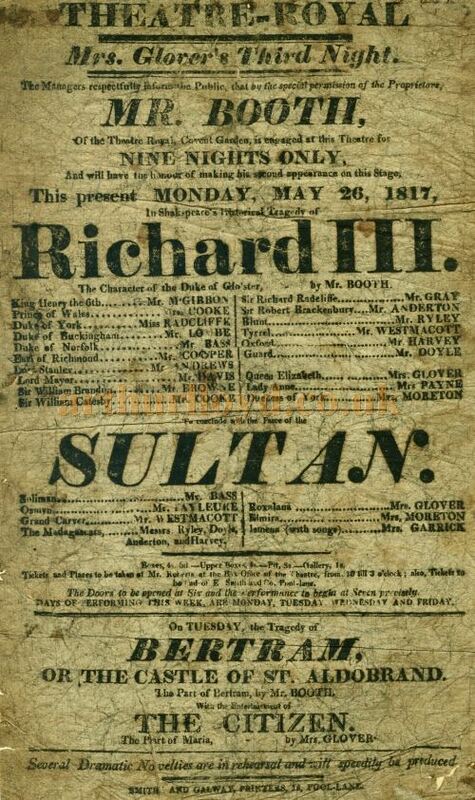 Above - An early Bill for the Theatre Royal, Williamson Square, Liverpool on Tuesday the 20th of June 1809 - Courtesy Carol Shone. Above - An early Bill for the Theatre Royal, Williamson Square, Liverpool on Monday the 26th of May 1817 - Courtesy Carol Shone. 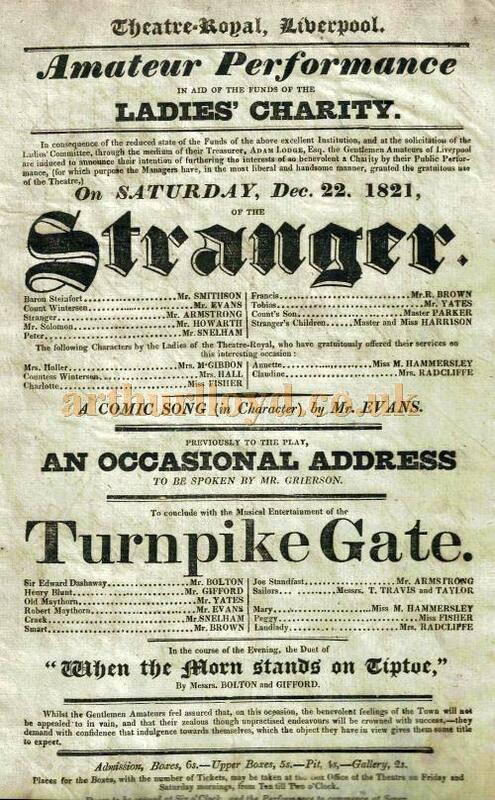 Above - A Bill for an Amateur Performance of 'Stranger' and 'Turnpike Gate' in aid of the Ladies Charity, at the Theatre Royal, Williamson Square, Liverpool on Saturday the 22nd of December, 1821 - Courtesy Gerrard Shannon and George Richmond. 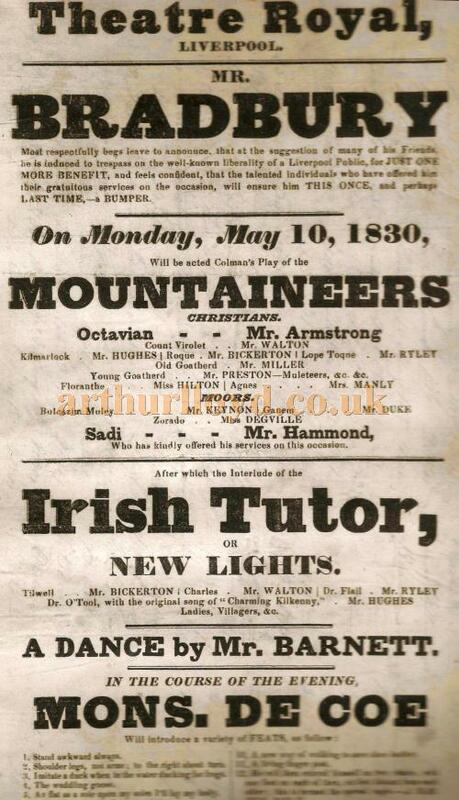 Above - A Bill for a Benefit for Mr. Bradbury of Colman's play 'Mountaineers' and 'Irish Tutor or New Lights' at the Theatre Royal, Williamson Square, Liverpool on Monday the 10th of May 1830 - Courtesy Gerrard Shannon and George Richmond.